On Friday, we decided to go on what we now like to call our "biannual camping trip". Two years ago, we bought lots of camping gear. We went when I was 35 weeks pregnant with Indi. Let's just say sleeping on the hard ground didn't work out so well for me then. We bought one super-sized air mattress for us and one for the kids. Pretty sweet set up, huh?! Dan calls our tent the Taj Ma-tent because it's so huge. Yes, we are most certainly Gucci camping. This is around the time that my camera broke, but I did get this picture of the kids playing one of their made-up games entitled "Swinging like a Monkey". I'll end this post by saying that I was completely mesmerized by the beauty of Texas Hill Country (which is where we camped)! 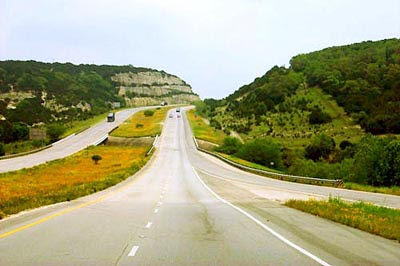 I know that probably sounds ignorant, but in the few years we've lived here, the only road trips we've taken have been from here to Dallas. Let's just say it's not exactly a scenic drive. The campground that we chose was about two hours away and we were surrounded by absolutely breathtaking views most of the drive. Since I was cameraless, I did not get any pictures but I found these on Google Images. Wow-those are beautiful pics! My husband just left for Austin today-comes back on Friday-a quick trip to visit some clients-i thought of you . . . i wish i could have tagged along! Maybe another time-i like coming in the summer so the kids can swim. 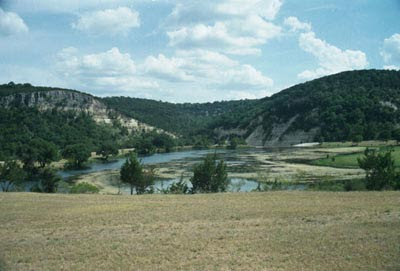 Have you ever heard of "Barton Creek?" That's where we stay-it's really nice-and they have a great pool. His clients mostly live in Barton Creek. VERY sweet set up! That looks like so much fun, the kids look too cute in the big comfy bed! I told my husband I want to start going camping with our kids...some of my favorite memories from being a kid are camping. What a beautiful area you went to, geez I wish it looked like that here! Gucci camping is the way to go! Looks like a lot of fun! Beautiful country, and your type of camping is right up my alley! THAT IS MY KIND OF CAMPING! Rachel, I honestly thought that Indi was holding the lead to a small pony in the air mattress shot! I had to look twice! The scenery sounds lovely and I'm glad you got to experience that part of Texas! LOVE the cutie-patootey monkey shot!! So fun and I think that is a great investment you can use over and over and doesn't take much room to store. Now that is some comfy camping! You guys are a fun family. 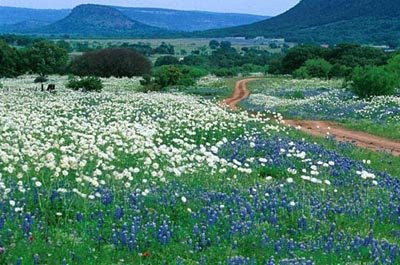 We love the hill country. Quiet beautiful. gucci camping...funny! we were just at REI the other day and i was thinking about how camping fun would be w/M, but then i came to my senses. so in all of those pics you didn't get ONE of your new hairdo?????? c'mon, we are waiting!! !